I heard of a large sales organization whose Culture facilitated an ‘on the bench’ Sales philosophy. They would deliberately over hire by one or two Sales People so that they would not have enough Sales territories to go around. Those without territories, the ‘have-nots’, were left to hang-about on the outskirts, maybe put through horrendous rookie training or endless online courses to eat up their time while they waited for a territory to become free. Those with territories, the ‘haves’, were forever looking over their shoulders, perceiving those without to be threats to their livelihood and treated the ‘benchers’ as such, not including them in any strategy or information-sharing sessions lest they learn enough to steal their territories away…. What did this produce? Exactly what you might think. 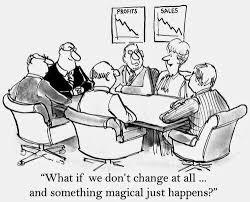 A Dysfunctional Culture of Fear for the Sales People, and a forever revolving door of Customer Facing Representatives for their Clients; both results being extremely non-productive, costly and just downright bad business. Are you taking a short-term approach to your Sales People? Do you think they are a ‘dime a dozen’, when one leaves another will be quick to fill their shoes? Have you stopped to consider the costs involved in having a high Churn rate, not only to your own Business but to the patience and loyalty of your Customers, constantly having to ‘train’ new Sales People? If you recognize your own Sales Organization in this description, first you need to understand that a Culture of Fear and constant Churn is both detrimental to not only your own bottom line, but to your Company’s relationship with your Customers. Sooner or later it will be in their best interest to let the Competitive Sales Person, who is intelligently prospecting them, to come in and have the chance to understand their business challenges as it is to meet, yet again, the new Sales Person from Company X. If you believe the turn-style approach is working effectively for you, then carry on at your own discretion by all means. However, if you are beginning to see that it is an incredibly high-risk and costly approach to managing your Sales Organization, it may be time to consider outsourcing this function to a company that has extensive experience in determining what is needed to establish a winning sales culture from the ground up. A new technological tool like CRM or other collaboration platform on its own won’t accomplish a new culture for you; they will just ‘package up’ the existing one more effectively. Save your money. A change in Corporate Culture requires Senior Management Commitment – no knee-jerk reactions mid-stream – and the allowance for the time it takes to make what is, in effect, a monumental shift in your Sales Organization. Let us coach you. You can steer your ship in a new direction by adjusting your course carefully and with commitment. Or, you can just continue rearranging deck chairs on the Titanic.. the choice is yours. Martin Beauclair is an Entrepreneur, Business Leader and Active Supporter of Start-up Communities. For the past 20+ years he has launched and managed numerous technology product offerings, serving as Sr. Vice-President of Sales & Business Development at IgeaCare Group of Companies, Vice-President of Sales and Marketing at GlobeStar Systems and Director of Sales & Marketing at Edwards Systems Technology (Now GE Security). Today Martin heads up Access2Sales as CEO, and recently founded FalconRidge Trading, a related Strategic Sales company. Martin is a certified ADMA (Accredited Professional Administrator), a member of the AMA (American Marketing Association) and both UPSA & CPSA Professional Sales Associations. He is a graduate of the Harvard Business School (AMP), a bilingual BAA (Bachelor in Business Administration) from the University of Ottawa, and also holds an MBA in International Business Management from Laval University. He is currently pursuing his PhD in Business Administration at the University of Phoenix, and is a self-proclaimed ‘life-long learner’.